There are thoughts that I've been mulling over, feelings I've been digesting. I just can't focus on them yet. And between my bone-deep exhaustion and utter disorganization post-travel (we got back from our trip to Pittsburgh for my grandmother's viewing and funeral Mass late last night), and the all-too-usual utter lack of free time, I haven't really had the opportunity to write about them in a meaningful way, anyway. There are photos to share, but they're really just a montage of Mobile Moments, likely best saved for Sunday. There was my brother's impromptu dinner this evening, but Mia's overtired fussiness prevented me from really participating much, let alone having many pictures or details to share about it. Beyond that, I haven't the motivation to really put something interesting together to sum it all up. There's just me, tonight. Tired, troubled, lonely for my blog- which I've abandoned for two nights in a row now- but not really ready to reunite with it. 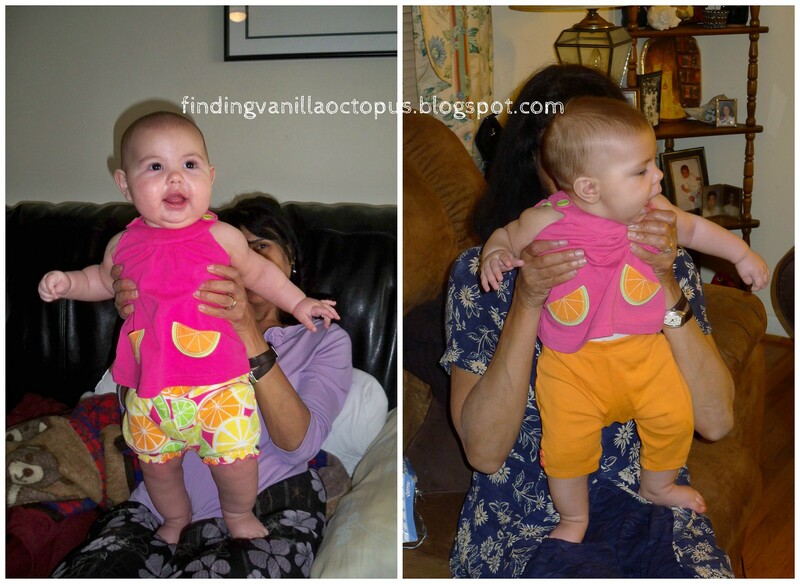 As you can see, though both are wearing Mima as an accessory, Abby sports the fruit-deco bloomers that actually go with the set, while Mia has on a set of capris that I raided from another outfit. It's too bad that Mia wouldn't look straight ahead for a better comparison of sibling similarity, but that's just how she rolls. I do think it's fair to say that Abby was the better model, but I can't decide if I like the bloomers or capris better from a fashion standpoint (not that I have ever been particularly stylish, myself). But I suppose that's the point of the whole thing, right? To get a general consensus from the Peanut Gallery? So, humor me here. Both babies are winners, obviously, but which pairing works best- the bloomers or capris?